This topic contains 9 replies, has 2 voices, and was last updated by wk28 8 months ago. 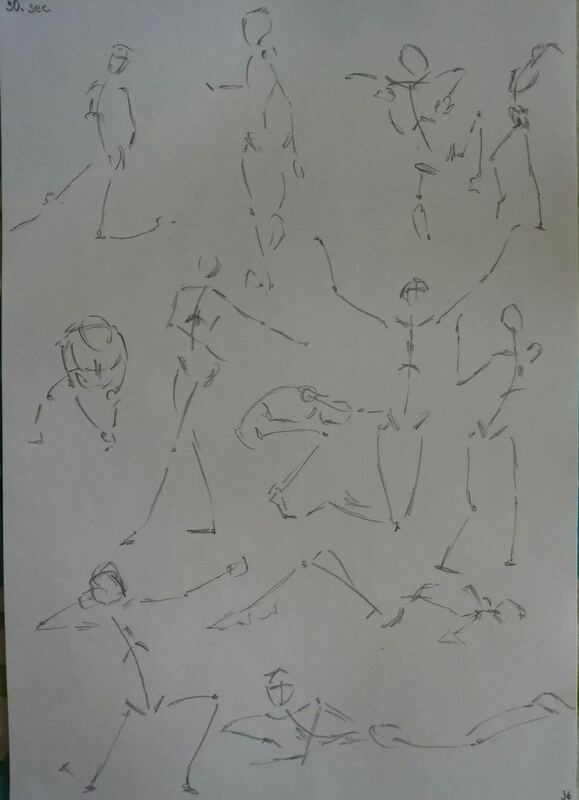 Hey Wk28, I like your drawings and there's only a minor thing I feel competent enough to touch on. I like more neat pieces myself so I may be biased but try limiting your shading, it can easily become a crutch for poor construction and anatomy. 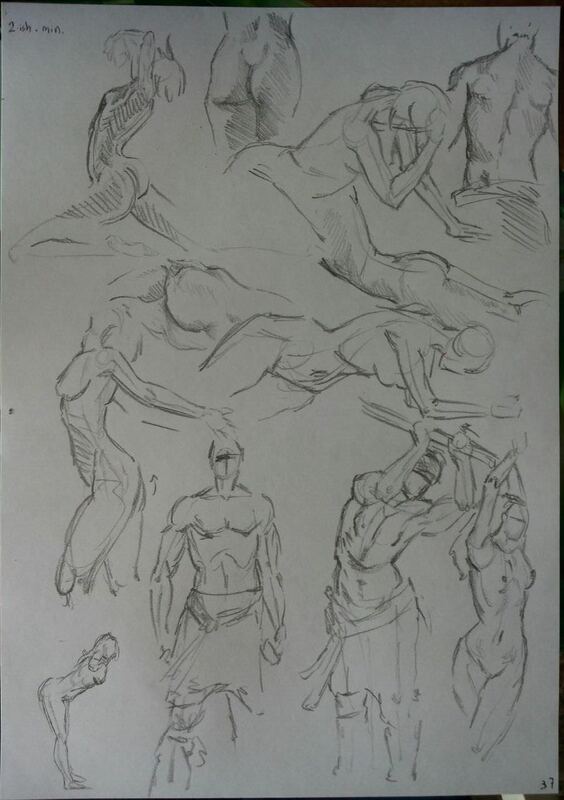 In 5 minute poses try focus on the things that you struggle with, shading is the easy part, it's the dessert after a good day of hard work in construction and flexing dem anatomy knoleges. Hi Nsw, thanks for your reply! I'll try to follow your advice and improve on construction/anatomy as well. I never drew gesture before (not as how it should be intended) so I struggle a bit. Have you any tip for construction/gesture, or any recommended text? I will appreciate it so much (I'm reading Vilppu's drawing manual at the moment). Villpu is one of the great that's for sure so you're no doubt going to improve. Sheldon Borenstein (one of Villpus students) taught me the importance of GCAT (gesture, construction, anatomy and technique). One thing that always stuck with me was how he created these floating simple shapes and connected them with the opposing curves or straights with the rythm of muscles and tendons. Since you're already reading Villpu I have no doubt in my mind you will learn this too - the only thing I really can recommend is watching them demo life drawing. There are a few on youtube of Villpu, sheldon and Steve huston but on nma.art they've got plenty more like Charles Hu, Karl Gnass, Galieote ect. It's subscription based but is packed of master studies and all sorts of shnazzwazz and totally worth the marbles if you have limited study time. No problem, by the way what do you do with your 30 second drawings? Do you build on them after the session or do you leave them as they are? Now I'm doing a lot of 30 second drawings so I leave them as they are. 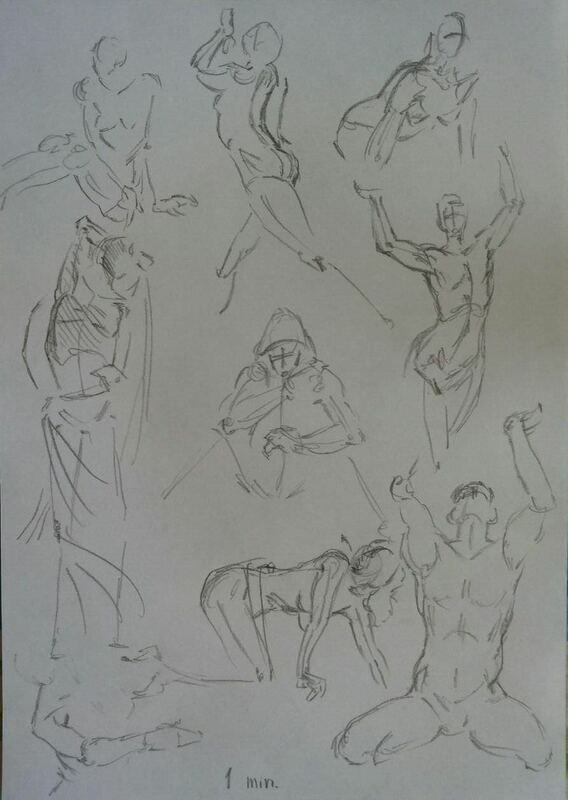 For larger poses I start with drawings like these and build on them the figure with simplified forms as boxes or cicrcles, cylinders, etc, trying to understand where certains muscles/bones are and how they are moving or flexing, but sincerely I lack of advanced knowledge about anatomy to do very detailed/accurate figures. I want to improve with my gestures before go deeper on anatomy, don't know if is the better thing but my gestures look odd to me, they seem to not capture the movement properly and I want to change it.